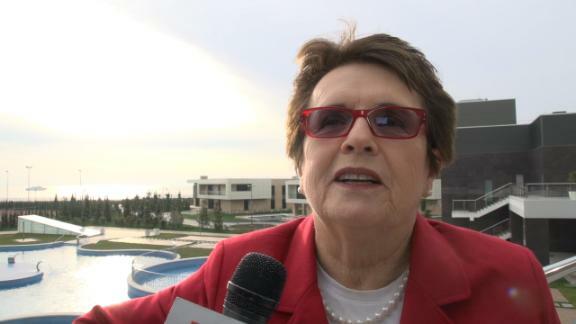 SOCHI, Russia -- You could see the fatigue in her face, but Billie Jean King wouldn't have wanted to be anywhere else. The openly gay tennis pioneer and gender equity activist, selected by President Barack Obama in December as a member of the official U.S. delegation for the opening ceremony of the Winter Games, canceled her trip when her mother's health deteriorated. Betty Moffitt died Feb. 7, the day of the ceremony, at age 91. "My mother would definitely want me to be here," King said. "I just feel very fortunate that I had a second chance to be here." King's selection, along with that of Olympic figure skating champion Brian Boitano and double Olympic ice hockey medalist Caitlin Cahow, was a civilized but pointed response to Russia's anti-gay "propaganda" legislation. Cahow, originally slated to come for Sunday's closing ceremony, filled in for King at the start of the Games. She and Boitano represented the United States as athletes, U.S. citizens and members of the LGBT community with equal amounts of dignity and enthusiasm. Speedskating champions Bonnie Blair and Eric Heiden will attend the closing with King and several U.S. government officials. There were no overt protests and few direct comments by athletes on the LGBT issue here -- unless you count athletes who made a statement with their excellence, like ski jumper Daniela Iraschko-Stolz, who won a silver medal for Austria and whose hyphenated name reflects her marriage to another woman. But King said she thinks the discussion generated before and during the Olympics has been positive. The most meaningful gesture the International Olympic Committee can make going forward is to change the Olympic Charter's anti-discrimination language to include a specific reference to sexual orientation, King said. "But you have to remember, it's not that easy," she cautioned, noting that LGBT rights are not where she would like to see them in the United States. "There are probably 70 countries where I would be incarcerated, there's probably -- these are not exact numbers -- 10 countries where I could be executed as a gay person," said King, who made her first trip to Russia in 1962 and returned many times as a player, Fed Cup captain and visitor. "If you're the leader like Mr. [IOC chief Thomas] Bach, it's not that easy. To have change takes time, takes a lot of dialogue ... We have to be patient, we have to keep pushing."